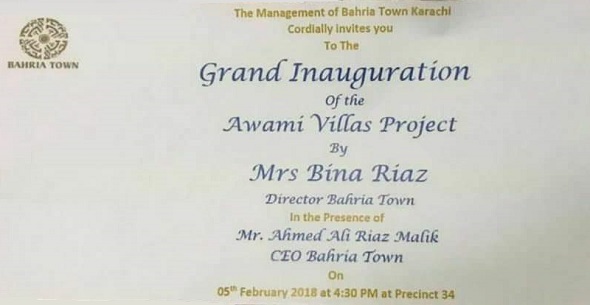 It has been about 3 years now, and once again we hear the news of grand inauguration of Awami Villas in Precinct 34 of Bahria Town Karachi on 5th February 2018 by Mrs Bina Riaz, Wife of Mr. Malik Riaz Hussain. Mrs Bina Riaz Malik holds the office of “Director Bahria Town”, and she will be performing the inauguration rituals in presence of her son Mr. Ali Riaz Malik, The CEO of Bahria Town. There is no further information available as to whether this awami villas is the same project that was meant for the deserving low income families of Karachi, or this is some other launch of apartments or homes in Bahria Sports City Precinct 34. Apparently, it seems to be the same old project and hopefully its registration forms will be available soon on bahria town’s website as well as at their offices across the country.